Bozteck VENM Remote Desktop Manager is a collection of the many remote desktop and network management tools that I have needed over the years wrapped into a single intuitive console. VENM (formerly VNCScan) uses Microsoft’s secure RDP as well as the option of open source VNC services to connect remotely to your server and workstations to manage their desktops. What many people are not aware of, however, is that the remote desktop control feature only scratches the surface of the power that is packed into this Swiss army knife of a management console. Bozteck VENM allows you to create your own scripts (or copy/paste from other sources) and run them remotely on your networked computers without disturbing the users who are currently logged in. These can be Windows batch scripts, PowerShell, VBScript, or KixStart scripts. Bozteck has written a streamlined, lightweight way of capturing remote desktop screens into jpegs and displaying them in tabs in the form of re-sizable tile grids. You can even log the images into folders for later auditing and forensics. This is an excellent feature for monitoring kiosks, school desktops, and secured terminals. If you work in a field where you find yourself frequently modifying the HOSTS files on remote computers, VENM makes this a super easy two-click operation. VENM makes it easy to sweep your network for maleware that is starting up automatically on your desktops. You can simply right-click a computer and open the auto-run editor and quickly remove startup items. VENM can remotely connect to your Windows PC and open a remote command prompt with no pre-installed client software on those PC’s. The only requirement is that you are connecting with Administrator level privileges on the remote PC. 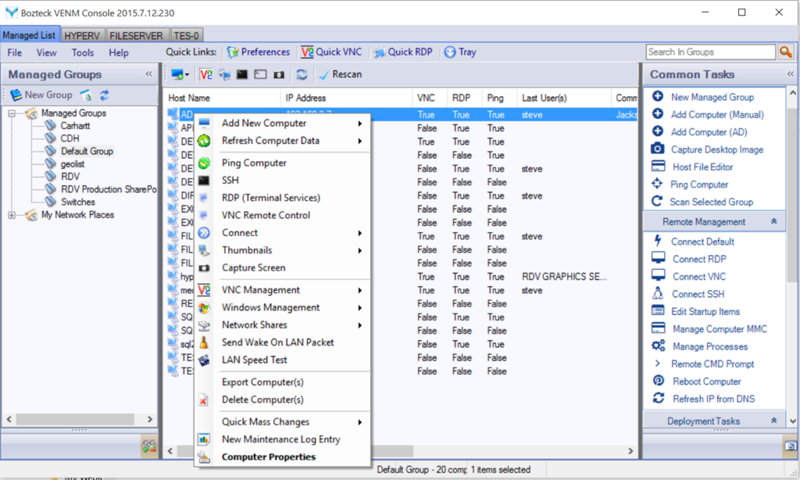 VENM places all of your RDP connections into dedicated tabs. There is even an option to automatically re-open your RDP tabs every time that you launch the console. 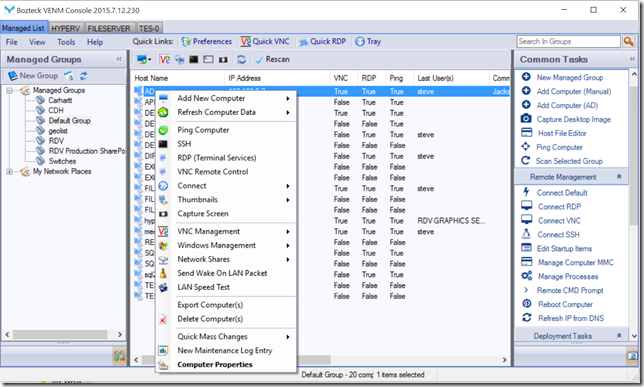 VENM can remember your RDP connection options per-group or per-computer as well as the connection usernames and passwords. Your connections can remain inside of their tabs or expanded out to full screen. If your remote computers are not currently running the Remote Desktop services, VENM can reach out and enable RDP on them with only two clicks! VENM was previously known as VNCScan. While the name has been changed, the strong support for VNC remains unmatched by tools of this kind. Three flavors of open source VNC can be easily deployed to remote computers using the powerful VNC Deployment tool. This tool allows you to create multiple profiles containing custom VNC settings and push them out to workstations. There is also a multi-threaded network scanner built into the console that can quickly discover computers on your network and place them into your management groups. Full Active Directory integration makes it easy to add computers from AD. There is so much more to VENM and you really need to play with it to get a feel for the time saving power that this console can provide. This entry was posted in Blog and tagged monitoring, Powershell, RDP, Scripting, vnc. Bookmark the permalink.